A salt breeze rustled the palms as my parents and I stepped out on a hidden spit of beach beyond the St. Marks Lighthouse, down a beaten path that led along the edge of the marsh impoundment. Bright white sand contrasted with the deep blue horizon, the shallows of the Gulf of Mexico mere steps away. The path less traveled led along this shoreline to a dense thicket of palms where we could stand in the shadows and watch the shorebirds from a virtual bird blind. 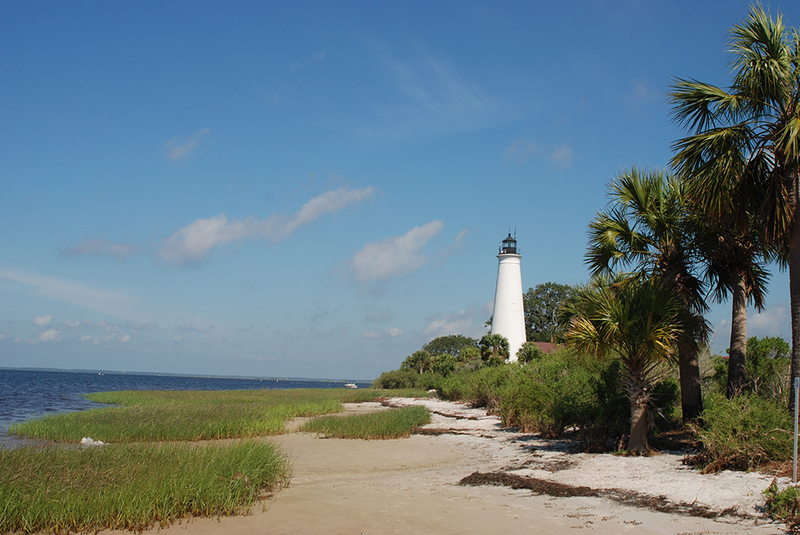 Back at the parking area adjoining the historic lighthouse, which was moved to this spot in 1842 and remains under the care of St. Marks National Wildlife Refuge, we circled the nearest impoundment on the Lighthouse Levee Trail, enjoying the expansive views across natural shores. 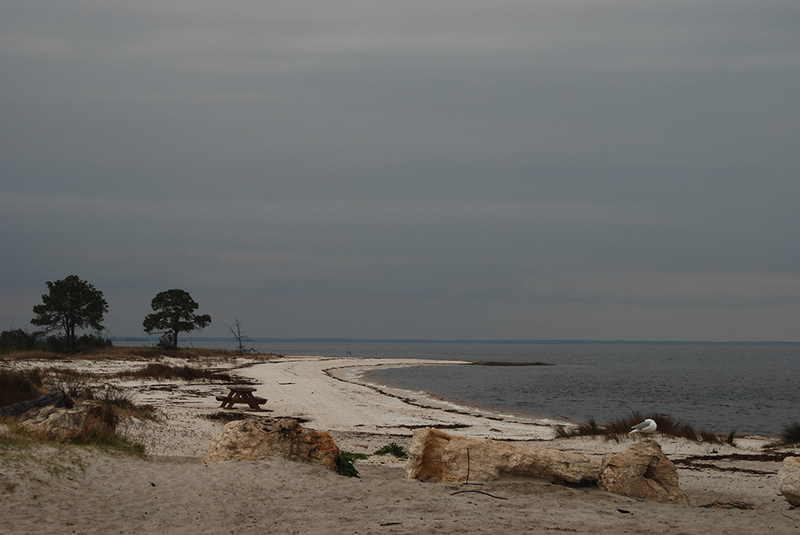 Unlike most of Florida, Wakulla County is blessed with a mostly undeveloped coastline. Credit goes to the lack of showy beaches along the Big Bend, for coastal marshes meld with the Gulf of Mexico, a ribbon of green and blue interrupted only in a few spots south of US 98. Most of the coastline is protected by St. Marks National Wildlife Refuge, with a handful of county lands thrown in for good measure. Part of St. Marks National Wildlife Refuge, Wakulla Beach is a natural gem hidden at the end of Wakulla Beach Rd, a quiet sweep of shoreline that once echoed with merrymakers in a waterfront hotel at East Goose Creek. Remains of the structure, demolished in the 1940s, are in the forest near Goose Creek Bay. At the very end of Shell Point Road is one of those surprising interruptions on this protected coast, a cluster of waterfront homes and small condos. 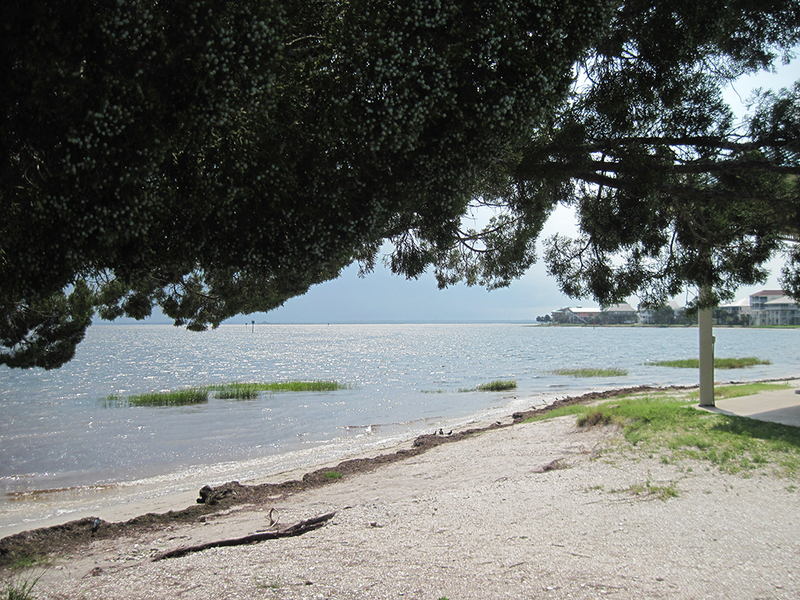 A small county park, Shell Point Beach, provides public access for picnicking, fishing, and wading. Punctuated with grasses, the sandy strand sweeps past picnic tables with a breezy view to encompass an ancient cedar tree sitting atop a cluster of oyster shells, perhaps the remnants of an ancient midden. It’s the best reason to visit this shore, this windswept sentinel that has survived the test of time. 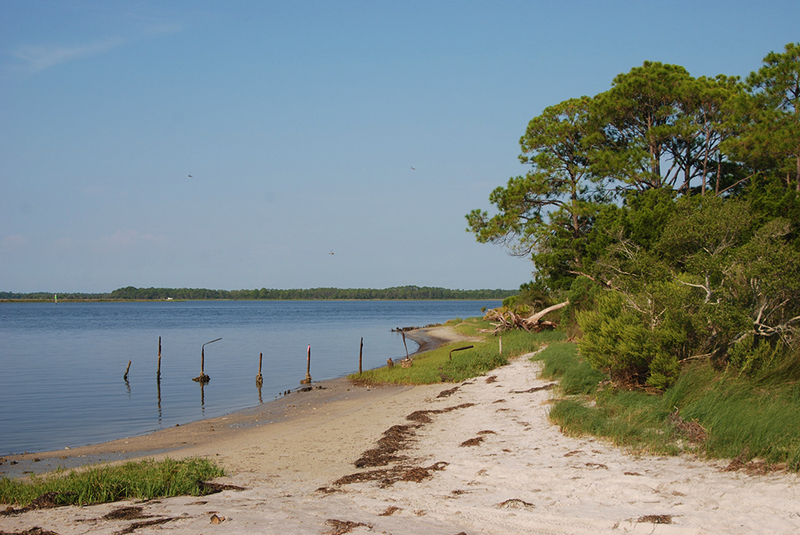 A pleasant stop for a beach hike is Dickerson Bay, a fabulous birding spot and put in for kayakers and anglers. The strip of sand is narrow but inviting, arcing around towards Panacea. It’s here that you might glimpse volunteers with the Gulf Specimen Marine Lab drawing a net through the shallows to inventory the health of the microfauna of this coast. Farthest west is the small strand at Mashes Sands, at the point of land where Ochlockonee Bay flows into the Gulf of Mexico and Mashes Sands Road ends at this small county park. On a warm day, you’ll find cars lined up and down the road since this is the closest beach of this size to Tallahassee. It’s more fun to arrive in the fog and early morning breeze to trek a quiet shore north to the outflow of Sand Creek, taking in the expanse of the Gulf and the shorebirds settling onto the sands.